The other day my wife saw something in the local paper about an Autocirc pump. The pump was mentioned as a device to save water and get hot water to your faucets faster. I hadn't heard of it before so I did a Google search. The Autocirc1 is made by Laing. The Autocirc1 pump is designed to keep hot water in your pipes at all time. 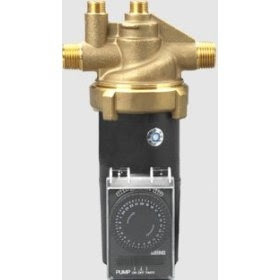 The pump has a thermostat and will kick on when the water goes below 85 C and then kick off when water hits 95 C. It is designed to install under your sink in the sink furthest from your hot water heater so that it will keep hot water in the pipes for all the sinks and showers in between. The benefits are 3 fold: The pump will save you money on your water bill. It will save water. Plus it will get you hot water faster and you won't have to run the tap waiting for hot water. Laing claims the savings are in the $100-300 range for a typical family of 4. I found one reference to an individual who said they were saving $100 a year on their water bill. You can buy the pump for around $250-300 at retailers like Home Depot or Amazon. Amazon has the ACT-303-BTW autocirc1 model of $259. Home Depot has an Autocirc1 for $239. So the payback period should be in the range of 1-3 years. The pump looks fairly easy to install and should be a do it yourself project for someone somewhat competent at DYI. The Autocirc1 model pump does require an AC outlet to power itself though, so if you don't have a power outlet under your sink then this might increase installation difficulty. Laing also made an Autocirc2 which doesn't need AC outlet at the faucet but I can not find that version for sale anywhere. I found a reference to another company named Grundfos winning a lawsuit over patent infringement on the Autocirc2 so Laing may have pulled the model due to that. That lead me to look for similar pump by Grundfos. I found the Grundfos recirculator pump for sale at $225. Given the energy savings, water savings and extra convenience one of these devices looks like a good purchase.